LONDON, England (CNN) -- Three years from Monday, the eyes of the world will be on London for the opening ceremony of the 2012 Olympic Games. 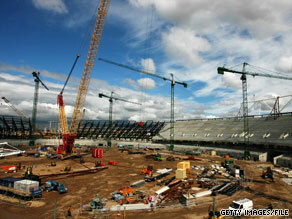 Work continues on the Olympic Stadium on May 15 in London, England. The city is celebrating the three-year mark by showcasing the event's centerpiece -- the under-construction Olympic Park -- and highlighting the progress made on everything from building work to transportation to getting sponsorship money. "We are exactly where we would want to be at this moment," Sebastian Coe, chairman of the London 2012 Organizing Committee (LOCOG), told journalists last week. "Our overarching message is that we're halfway through on our journey. We're on budget, we're on track, and we have an ambition to deliver a great Games." The Javelin high-speed train from St. Pancras station to Stratford International in east London will, by Games time, carry as many as 25,000 visitors an hour. From Stratford, visitors will be able to walk to the park. With a journey time of about seven minutes, the train service means London's Olympic Park will be more quickly accessed from the host city than has been the case in any previous Olympic Games, LOCOG officials say. The 140-miles-per-hour train is a core part of London's Olympic transportation plans. But many of those plans are still unclear. "I think they do need to maybe explain more, tell more about what's being done to make London ready for the Olympics in that sense -- transportation -- because that was one of the key issues before the vote in Singapore (when London won the Games in 2005)," said Ed Hula, the editor and founder of Olympics Web site Around the Rings. Officials are putting details together for the Olympic route network that will allow athletes to move around the city easily -- "as competitors, rather than commuters," Coe said. Traffic-easing measures will allow little or no disruption to locals who want to either attend the Games or just go about their normal workday, Coe said. The "small measures" needed for those transport plans to go through must, however, first be approved by the British Parliament, he said. The stadium and aquatics center should be finished by 2011 to allow them to be used for Olympic test events, Coe said. Seven of the 11 high-rises at the village, which will house the athletes, are almost done and the foundations are in place for the other four, Coe said. Funding for the athletes' village was initially expected to come from the private sector, but the credit crunch and downturn in the property market meant planners had to instead use money from a prearranged contingency fund. Olympic officials insist that was precisely the purpose of the fund, and that using money so early in the planning process did not jeopardize any other projects. Almost all of LOCOG's £2 billion ($3.3-billion) budget is coming from the private sector, with sponsorship being a key part. The committee says that so far it has done well on that score, having just announced its 21st sponsor, with 12 sponsors signed up this year. With contributions from the International Olympic Committee, London is halfway toward meeting its budget goal, Coe said. Securing the rest may be a bit more difficult, especially given the economic climate, Hula said. "The final group of sponsors may be tougher to get than initially expected," Hula said. "Whether they're going to get that still remains to be seen." As the Olympic Park takes shape, it becomes easier to see how London is regenerating the former wasteland on which the park is being built. That was another cornerstone of London's successful Olympic bid four years ago -- leaving a legacy. The River Lea, which runs next to the park, is being cleaned and widened after years of neglect and contamination. A canal used to bring freight to the Olympic site has been dredged and the walls of the river have been restored and replaced, the Olympic committee says. After the Games, the entire Olympic park will be opened up to become one of the largest urban parks created in Europe in more than 150 years. The apartments at the athlete's village will be turned into housing. The need to resort to contingency funding to build the village forced planning changes that will actually make the buildings more suitable for their post-games use, Coe said. Legacy for the sports venues -- making sure they won't be white elephants after the Games -- will differentiate London from last year's Olympics in Beijing, Hula said. "London is paying much more attention to legacy value, to the bricks and mortar work that they undertake," he said. "London is being much more careful about avoiding construction on facilities that are not going to be used after the Games." What the city already has in place is a tourist infrastructure that should serve the city well during the Olympics period, Hula said. "It's got subways, it's got hotels, it's got tourist infrastructure like restaurants, the theaters," Hula said. "They've had to build a lot, but in other ways they haven't had to do so much to get ready for the Games. Still, a pretty high price tag, whatever it's going to work out to be."